VLC is not only a powerful, customisable and versatile media player, it's also available for pretty much every platform around. The installer is fairly self-explanatory and you shouldn't need to change any of the default options. The only section you need to pay particular attention to is 'Choose components', where you might want to be selective about which elements and extensions to install. If in doubt, leave everything selected. The main VLC interface is a pretty simple affair, and the first thing you'll want to do is to load a video. You can do this by dragging and dropping a file onto the program window, or by click the Media menu followed by Open File. Notice you can also open video streams as well as discs. At the bottom of the program window are controls similar to those you would find in any other media player – play, stop and pause, volume control, and a progress bar to allow you to jump to a specific section of a video. VLC gives you a great deal of control over how your videos look and sound. Click the graphic equaliser button at the bottom of the window (it's the sixth button from the left), or click Tools > Effects and Filters to bring up the audio and video controls. To adjust sound you will need to check the Enable box and then use the sliders to tweak different audio frequencies to your liking. As well as basic adjustments, you can also use the Compressor and Spatilizer tabs to experiment with more advanced effects. While we're looking at the Adjustments and Effects dialog, it's worth mentioning that the Synchronization tab can be used to alleviate the problem of sound and video that is not in sync. By introducing a pause in the audio, or bring it forward, you can stop enduring videos that look like they have been badly dubbed. Moving to the Video Effects tab in the middle, there are lots of controls that can be used to improve the appearance of footage by tweaking setting such as a colour, hue, sharpness and so on. There's even the option to rotate video – great for footage that was shot in the wrong mode on a phone. On the Synchronization tab, you may have noticed that VLC features support for subtitles. 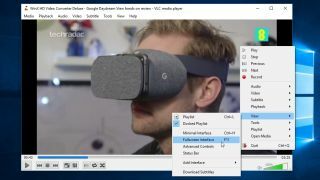 You might already have subtitles for the videos you want to watch, but it is also possible to download them from within the program. Click the View menu and select the Download Subtitles option; you can then perform a search for any subtitles that might exist for what you are watching. VLC will automatically search for subtitles based on the name of the file you have loaded, but you can change this search to anything you like. There are various views that you can experiment with in VLC. The program starts in windowed mode by default, but if you are settling down to watch a movie, you'll probably want to switch to full screen mode – just click View > Fullscreen Interface, or press F11. The basic windowed mode can be resized like any other program window, but if you find the on-screen controls distracting, you can press Ctrl + H to toggle a more minimal look. How you view depends on what you are doing, but there is the interesting option to play your video as if it was your desktop wallpaper by selecting Video > Set as Wallpaper. If you've switched to the Minimal Interface or Full Screen mode, you might be wondering how you go about controlling playback. Don't worry, there's no need to learn a series of keyboard shortcuts if you don’t want to! If you're in Full Screen mode, all you need to do is move the mouse and a set of playback controls will pop into view. They disappear again after you leave the mouse alone for a while. In the Minimal Interface, you just need to right-click on the video that's playing, and you can use the menu that appears to control playback. There are a few other things that it is worth knowing about VLC, the first being that it is possible to take a screenshot of the video you're watching. Just select Take Snapshot from the View menu. Another handy feature is the ability to create playlists. This is a great option if you're looking to binge-watch a series of video back-to-back and don’t want to have to go to the hassle of manually starting each one. Click View > Playlist, or press Ctrl+L, and you can add all of the videos you would like to include.